Easy Raspberry Breakfast Quinoa Bars that are sure to brighten up your day! They’re sweet, wholesome, and perfect to take with you on-the-go! Renovating a kitchen is no joke, friends. It’s intense!! We had been thinking about renovating for quite awhile (read the Banana Chocolate Chip Baked Oatmeal Cups post for more on that), but really had no idea what we were getting into. Cody and I aren’t the handiest people on earth, so attempting to plan it out was interesting to say the least! In a week, we’ve managed to tear apart our kitchen and yet make it more beautiful at the same time. We’ve removed the island countertops, cut into the dry wall behind the stove (that was fun….NOT), removed all hardware, and have painted half of our bottom cabinets a matte black! We’re going for white cabinets on top, matte black cabinets on the bottom, and hopefully brass or gold hardware. A full blog post about our kitchen remodel will be coming soon, so stay tuned! Maybe once the cabinets are done and we aren’t storing our dishes in our bedrooms (true story). In the meantime, follow my personal Insta for updates via Insta story! These Easy Raspberry Breakfast Quinoa Bars are perfect for busy seasons of life! I would say they’re pretty perfect for the kitchen remodel life we’re living over here! 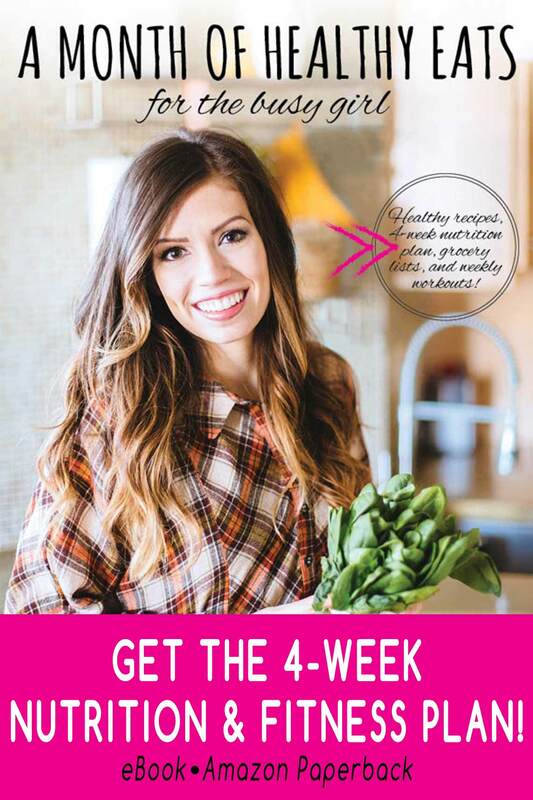 They’re so easy to make and can be stored in the fridge for about a week. 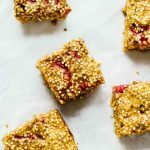 These Easy Raspberry Breakfast Quinoa Bars can be made in about 30 minutes and are great for taking on-the-go, too! Here’s what you’ll need to make these Easy Raspberry Breakfast Quinoa Bars. They’re refined sugar free, so you’ll need bananas and maple syrup to sweeten them a little bit 😉 You’ll also need cashew butter and eggs as your binding agents, and raspberries because, well, Raspberry Breakfast Quinoa Bars. But if you’re really feeling another type of fruit, you could always play around with the flavors in this recipe! And last but not least, you’ll need blended oats (or oat flour) and delicious quinoa to make these bars. For the quinoa in this recipe, I used truRoots 100% Whole Grain Quinoa (that I purchased at Target). I love how easy this quinoa was to use in the recipe, and the quality is just amazing! It’s a really great quinoa to keep on hand for recipes like this one 😉 If you’re inspired to try it out, be sure to use the Target Cartwheel offer to save when you purchase truRoots. The offer ends Oct. 7th, so be sure to grab it while you can! Try out this recipe for Easy Raspberry Breakfast Quinoa Bars! Mix all of the ingredients together in a mixing bowl (except for the raspberries). Mix in the raspberries, allowing them to break apart. Pour into a square 8" x 8" cake pan covered with parchment paper. Allow to cool, then remove from the cake pan and slice into rectangles. These Easy Raspberry Breakfast Quinoa Bars last about a week in the refrigerator! Ok, rookie question… should the quinoa be pre-cooked or does the baking cook the quinoa? And would it change anything if I use a different brand of quinoa that I already have in the house? Thanks! Yessss! It’s so great. Love it! Holy yum! Love your idea of using quinoa for breakfast! These look so tasty! 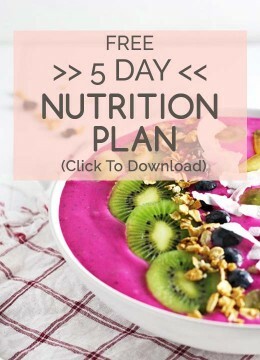 What a great plant protein-packed breakfast option for busy days. I’m totally going to make these later today! They look super easy and so tasty! I am deff trying them. The ingredients in this are so perfect for my household and I love all of those little quinoa seeds in there – it looks so intriguing. I am so in love with these! I love raspberry anything! Oh my gosh, these are so yummy! I need these in my life! Sounds really good. I bet these would be good on the run, too. I’ll have to try! Thanks!